Care to Help is a nonprofit 501(c)3 organization dedicated to assisting the global community to live more productive and meaningful lives by addressing basic health and educational needs. Care to Help's current focus is securing healthy drinking water for the minority hill tribe people of Central Vietnam. 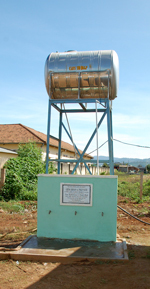 Many people in the rural Central Highlands do not have a safe source for clean drinking water. Securing a safe source of water is the essential foundation of a healthy existence. Care to Help drills deep groundwater wells to provide safe water to these rural communities. The level of health in these villages rapidly improves after completion of one of these projects. The wells are completed at a cost of only $5 to $7 per villager. All funding for construction of the safe water projects has come from individuals and small businesses. Virtually 100% of donated funds goes directly to funding construction of the projects. As of Jan 1, 2012, The Care to Help Project has completed 23 safe water well projects, 7 school buildings, one orphanage dormitory building, and several free health fairs in the villages where we have built projects.